An innocent man who was set on fire and beaten by police who mistook him for a criminal is suing the department for $25 million. Jersey City, NJ — A high-speed chase in Jersey City ended when the car police were chasing crashed, turned another man’s car into a ball of flames. But it’s the chaotic insanity which followed the crash and the fire that has now resulted in the indictment of several Jersey City police officers and a massive lawsuit against the city and the department. 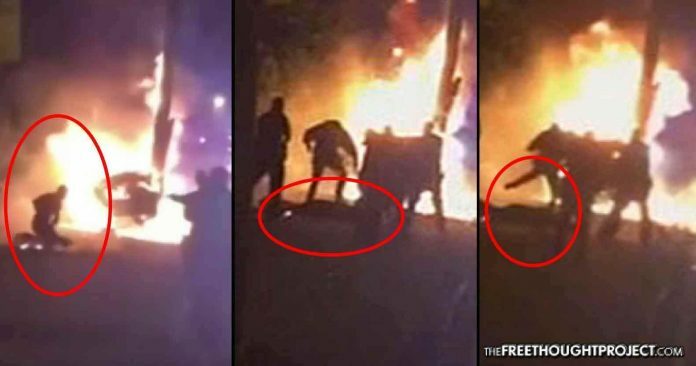 As TFTP reported last month, the group of New Jersey police officers involved have been indicted, including two for attempted murder, after they were caught on camera kicking Feliz as he crawled from the burning wreckage of a crash involving the persuit of Leo Pinkston.